I think we might have found our family Mass time! Our family has been bouncing around to different Masses, trying to find the one that works best for our schedule. But between the twins' naps and meals, and CC's naps, and everyone's bedtime, it's harder than it seems. Our church also does not have a cry room, which means that if any of the three babies start fussing, MJ has to bring them out into the vestibule, leaving me with the other two ... and I'm sure you can imagine that it doesn't always work out. So this is why it's so important for us to find a time to go to church when all three kids have a good chance of staying quiet. 5 pm Mass (Saturday or Sunday) doesn't work, because it's 6:15 by the time we get done, and no one has eaten dinner or had baths yet -- so all three are hungry (read: cranky) and end up getting to bed late. 7:30 am Mass, the one that MJ and I used to attend regularly, is just too hard to get to with three babies. We've done it a few times, but I have to get up at around 5:45 am to get myself ready before tending to the kids, and it just seems like a bridge too far most weeks. 9 am Mass was ideal when Sweet Pea and Little Man could just take their morning naps in their carseats right there in the pews. But the last few months they've become more alert and easily distracted, so they won't sleep in their carseats. So 9 am Mass has been a disaster lately, because it's right when they need to nap. 12:30 Mass is another horrible time for our schedule, because all three kids nap at 1. Trying to get them to sit through Mass when they are all tired is a recipe for disaster. (I mean the bag, not CC -- although she's cute too!). 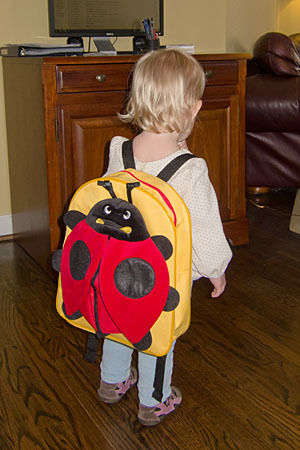 Grandma and Grandpa gave that bag to CC last year, and she's finally big enough to wear it. I've decided it's going to be her church bag, and we filled it with a few religious children's books and a sippy cup of water.